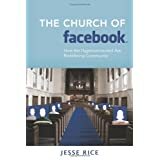 The Church of Facebook: How the Hyperconnected Are Redefining Community ReviewI heard about Jesse Rice's book, "The Church of Facebook: How the Wireless Generation is Redefining Community" from an interview he did on a podcast. The topic of online community and whether or not it can be authentic is of interest to me. I wasn't sure what to expect; perhaps a Christianized critique of the whole social networking phenomenon complete with a set of warnings for believers and suggested rules for underage children. Thankfully this is not Jesse's book. Instead it opens with a fascinating story of the opening day on the Millennium Bridge crossing the Thames River in London. The unexpected shaking that day on the pedestrian footbridge is similar to the online spectacle of Facebook and other social networking sites. Jesse uses this and several other stories at the beginning of each chapter to create a historical framework for interpreting our online interactions. Jesse has done his research well and the book is very interesting because of it. The science of connecting with others, of creating a "home" where we feel safe is the subject of chapter one. This is followed by a chapter on revolutionary changes to society and how Facebook is set up to be, if it not already is, a world changer. Chapter three delves into the controls people have of their online presence, of the information they choose to share online with others on their profiles. He poses the question of what we will do with the power we have to create, to shape society, with our online influence. Chapter four studies the impact that all of the new information has on an individual, understanding that people have adapted their behavior with this new way to connect with people, share information and collect new data. The fifth chapter focuses on the question of community and whether or not it can be experienced online. Are our relational needs truly being met? The final chapter speaks to implications of using social networking and some of the inherent behaviors that could be attributed to living life via an online presence. Jesse suggests some boundaries to keep the experience healthy, balanced and authentic. Want to learn more information about The Church of Facebook: How the Hyperconnected Are Redefining Community?